Review adding and subtracting three-digit numbers with this quick practice quiz. 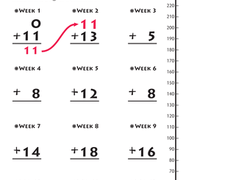 Help your child build basic math skills with this practice sheet, where she'll work on carrying over numbers. 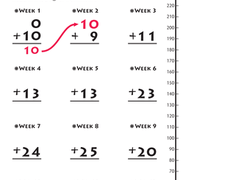 Bolster your third grader's addition skills with at-home practice in three-digit addition. Word problems make for great assessment tools because they require a complete understanding of the math concepts. Use this assessment to evaluate your students' abilities to add and subtract three-digit numbers using mixed operation word problems. Let's see how those addition skills have blossomed over the course of the year! Use this quick math assessment to gauge your students' abilities to add three-digit numbers, both with and without regrouping. How are your students coming along in their three-digit addition skills? Use this spring math assessment to gauge your students' abilities to add within 1,000. This math fluency checklist is a great tool that can be used to encourage students to use different strategies to solve math problems efficiently and accurately. Once your child masters addition with carrying, there's practically no number too big for her to add! Let your child get in some extra addition practice with this worksheet perfect for carrying beginners. Is your second grader ready to step up her carrying skills? This intermediate worksheet will test her powers of addition! Adding up big numbers can be tricky. Teach your budding mathematician a helpful trick to keep the numbers in line with carrying! Carrying over takes a bit of practice. Give your second grade mathematician a boost with these practice problems. If your child likes to carry, then this is the worksheet for her! This worksheet isn't for beginners! Let your math savvy kid take on this carrying challenge. Can he add up these big numbers to find the correct sum? Can your second grader use her addition ability to chart the growth of Augusto's snapdragon? What does carrying have to do with math? Help your second grader find out with this worksheet full of big number addition and carrying hints. Your second grader and his handy addition skills are needed! Can he help Ralph keep track of his hollyhock's growth?